I've always loved the timeless character and aesthetics of Taito's classic Space Invaders, but if I'm completely honest I just don't think that the game itself has aged particularly well over the past 30 or so years. With their considerably more dynamic attack waves, Namco's Galaxian and Galaga are much more fun, but when it comes to classic coin-op alien-shooters, Konami's Gyruss has always been my personal favourite. 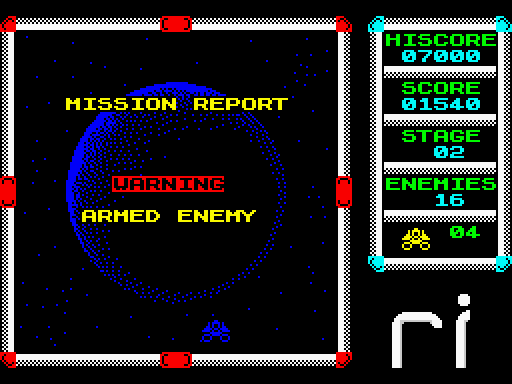 With it's innovative rotary shoot 'em up game-play and enemy waves that weave and dive in and out of the screen, Gyruss seems light years ahead of it's heritage - yet despite being hugely enjoyable to play it lacks a distinct visual identity. 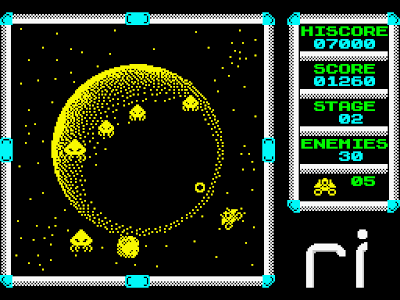 Space Invaders, Galaxian and Galaga all have immediately recognisable enemies, whereas Gyruss features rather generic looking spacecraft and nondescript spinning alien blobs. Now if only someone was to marry the future-proof Gyruss design with the classic visuals of those earlier shooters... Oh, hang on a sec - Retroinvaders, you say? What have we here then? Obviously this mash-up could never happen in the commercial world without lawsuits and cease-and-desists being issued aplenty, and as such Climacus' Retroinvaders is the kind of game that could only emerge from the no holds barred independent domain. 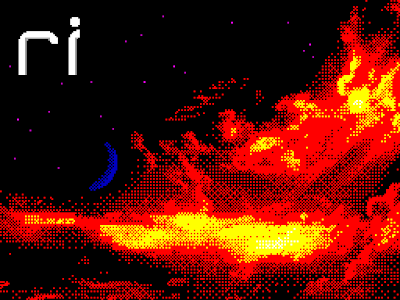 Available for the ZX Spectrum in both 48KB and (massively enhanced) 128KB versions, Retroinvaders immediately grabs your attention from the moment it finishes loading, with it's moody, percussion-heavy title soundtrack, stylish graphics and even a quirky little intro sequence (showing the Invaders being instructed on their new mode of attack). And from this impressive outset things only get better. 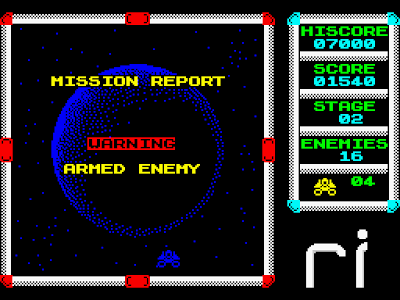 After redefining the default keyboard controls (sadly the option to use a joystick has been omitted) and starting the game you are presented with the game's briefing screen. It seems that Earth was reduced to a barren wasteland after the initial Invader attack 30 years ago, with only small pockets of survivors living in secrecy and fear of their alien oppressors. In typical shmup tradition, IT IS UP TO YOU (TM) to battle through the chain of four alien wormholes (in a prototype ship, probably) back to the invader homeworld to drop off a special signed-for delivery of super-warheads and negotiate a peace package. But it won't be easy - not only is each wormhole guarded by an Mothership and an army of armed (and unarmed) Invaders, but if you let too many escape your gun-sights unscathed then they'll destroy what is left of Earth and it's Game Over. 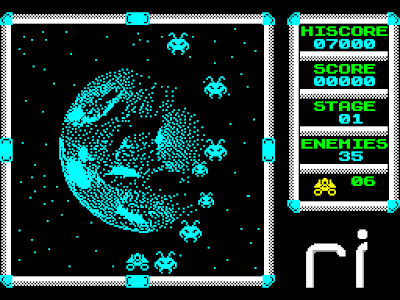 Retroinvaders plays pretty much identically to Gyruss, with the aliens whizzing around the screen in imaginative formations and (on later stages) firing back deadly volleys of flak in your direction. The addition of a 'hyperspace' button is a neat addition, but doesn't really help you that much in your mission due to it's random nature - a smart bomb would have been considerably more welcome. In fact, there's not a power-up in sight and aside from awarding you an extra ship every 1000 points the game doesn't mess around with pleasantries - it's a challenging fast-paced shmup that wants to see you die. At the beginning of each multi-wave stage you are presented with a kill quota, and failure to meet this before reaching the boss results in you having to start from the beginning of the stage again - so make sure you show those alien scum no mercy! It's refreshing to see a Spectrum game specifically designed for 128KB machines - the cut down 48KB version really pales in comparison, lacking the polish and presentation of it's bigger, bolder sibling. Although the stand-out 128KB feature has to be the music (which is amazing throughout), the visuals are top notch as well - despite being monochrome the in-game graphics are really well drawn with enemies and bullets never getting lost on the screen. But the real winning factor here is simply how much fun it is to play - Retroinvaders is a blast, and without a doubt the best ZX shooter I've played all year. Top marks.